The press release was printed, the media invited, the first dignitaries began filing into the room. Such was the scene on the first day of the Dubai Air Show, when Airbus had planned to unveil a keenly awaited lifeline for its A380 superjumbos from the aircraft’s biggest fan: Emirates. Instead: nothing. In fact, worse than nothing. An initial delay, not unusual at these major signing ceremonies, gave way to confusion. Bewilderment turned to humiliation when a model aircraft was carried into the briefing room and the gray cloth covering it slipped off – revealing the Boeing logo on its tail. Out of nowhere, the U.S. planemaker suddenly conquered Room 6 on the upper level of the main exhibition hall, with its representatives taking the stage. Airbus officials who dominated the room on arrival quietly slipped out during the press conference as their rival landed a stinging blow: Emirates committed to buying 40 of Boeing’s 787-10 Dreamliners, representing a staggering US$15.1 billion at list price. That was similar to the order value that Airbus had planned. It was a surprise twist in the air show’s first-day choreography and one that marked twin setbacks for the European planemaker. With scant demand from other airlines for the double-decker A380, Airbus is more dependent than ever on Emirates. Boeing’s Dreamliner pact added insult to injury since the Dubai-based carrier had originally ordered 70 Airbus A350 jetliners before pulling out of the deal in 2014 to review its requirements. Even with the first-day setback, Airbus has a knack for staging high-profile comebacks at major air shows. 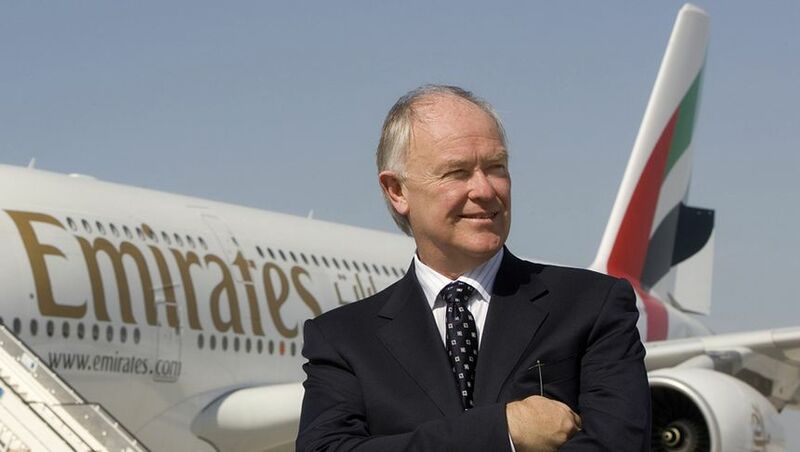 Airbus and Emirates declined to comment on the back and forth of the negotiations. Emirates is set to order about 36 A380s, according to people familiar with the negotiations – a deal that would carry a list value of about US$15.7 billion and which would push the order book for the giant jetliner to more than 170. Earlier this month, Emirates President Tim Clark took delivery of the 100th A380, cementing Emirates’ de facto status as the only buyer of Airbus’s biggest and most expensive aircraft. The biennial Dubai expo is an important venue for both manufacturers to secure deals for their biggest and most expensive jetliners. Two years ago, orders slowed to just US$4 billion, compared with more than US$170 billion at the previous event, placed largely by the three major carriers in the region: Emirates, Qatar Airways and Etihad Airways. The mood was more upbeat at this year’s event, with Clark saying demand remains strong, even for the most expensive seats. Clark unveiled a new first-class suite that will feature on its Boeing 777 models and will gradually rolled out across its entire fleet. I have a soft spot for Boeing (how can anyone who loves the 747 not?) but I really appreciate the incredile engineering feet Airbus performed with the A380 and it's genuinely a very pleasant aircraft to fly in. It's sad to see what is potentially another nail being hammered into the A380s coffin? And the 'only' wing has no winglet..
Wow, massive call. Airbus have been strategically pushed into a corner by Emirates, the future of the A380 will be answered soon. Well, the A380 is kind of dead. Looks like the bigger planes are to become dinosaurs. First it was the B747 and now the A380 will follow suit. I have travelled on the A380 and what a marvelous plane. So quiet and comfortable. An engineering feat just as the 747 before. Sad to see it go. Unfortunately the airlines have changed their business models/strategies and the smaller planes are the go. Have not been on the new B787 or A350. Looking forward to flying in one of the newer birds. My travels and loyalty to a particular airline always restricts me to the A330. Definitely not one of my favorite planes. The large wide bodies of the 747 and A380 are made for the ULH legs being flown by todays airlines. The spaciousness of their premium zones, the onboard lounges, etc are what passengers enjoy to help pass the long hours. The 787 and A350's which are taking over are not in the same league for these marathon legs, as they are simply to small and cramped, but do make profits for the airlines - customer comfort unfortunately no longer a concern. Passengers will ultimately choose their aircraft types in time but I feel the airlines may have lost touch and now only blinded by the bottom line. Lets hope there is a turn around in the next decade or so. Having just complete a r-t-w flight on 380/777/787/747, the 380 and 787 both knock the socks off the 777 and despite its age the 747 is not far behind its way newer sibling. The sheer space on the 380 made it our "winner" on this trip, so I, too, will be sad to see the end of them. Comment on "Emirates' Boeing 787 Dreamliner deal is a nightmare for Airbus"